Sit on the floor. Stretch your legs forward in front of you and keep them straight. Interlace your fingers and place your palms behind your head just above your neck. On an exhale, lean back slightly and lift your legs from the floor. Keep them "stiff as a poker with the knees tight and the toes pointing forwards." Balance on your buttocks. Feel your abdominal and low back muscles tone. Keep your legs lifted at an angle of 30-35 degrees from the floor and your feet in line with the crown of your head. Maintain the pose for 20-30 seconds with normal breathing. 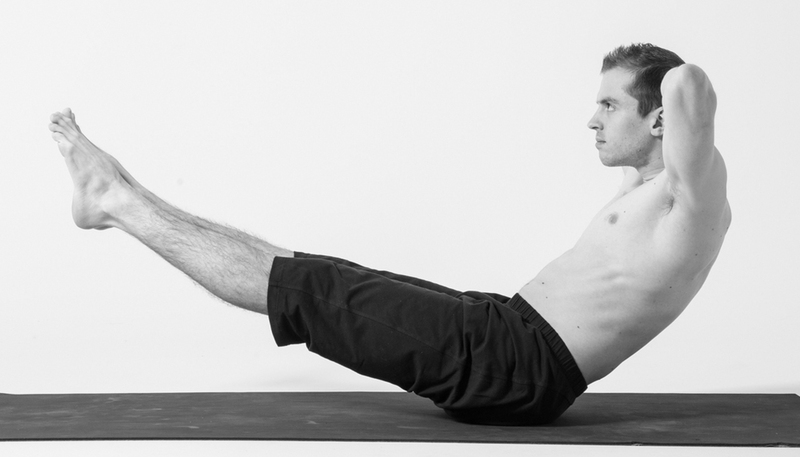 "A stay for one minute in this posture indicates strong abdominal muscles." Do not hold your breath in this position, but do not breathe too deeply either. According to Iyengar, holding your breath causes this pose to affect the muscles of the abdomen but not the internal organs. Breathing deeply causes the abdominal muscles to disengage. Breathe in a way that feels more normal and natural. My head position is gliding anteriorly (forward). Iyengar's head and neck appear more relaxed back.